TWO IS BETTER THAN ONE. 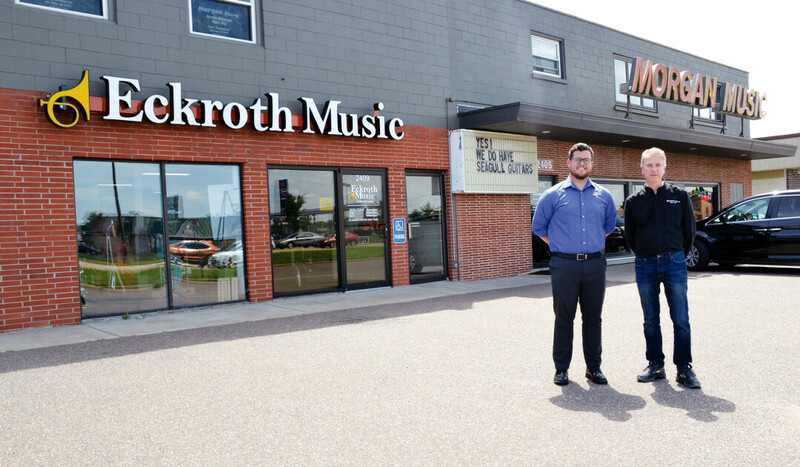 Tyler Henderson, manager of Eckroth Music, and Rich Morgan, owner of Morgan Music, formed a partnership to provide enhanced customer service. Both businesses are family-run, with generations of history. Morgan Music has had roots in Eau Claire since 1957. David “Bud” Morgan, a saxophone player from Chicago, moved to Eau Claire in the 1950s following military service during World War II. He met his wife here, and over the years he has been a traveling musician and owned a bar that featured live music. He decided to open a music store to keep his passion for music alive in a more financially stable career. Three generations of the Morgan family have worked at the store: Bud, his sons Todd, Gregg, and Rich, and Tal Morgan, Todd’s son. While the business is and has been successful for decades, the Morgan family decided it could be more successful going forward if it aligned with another business that could take over the school music sales and rental side of things. “As a small family business, it was getting more and more difficult to run a full-line music store in this day and age,” Rich said. “The school band/orchestra side of the business is very labor intensive and we wanted to do a better job of servicing the area schools, but we were spread too thin.” After a lot of thought and discussion, the family decided to stick with what they did best and team up with a complementary business. Rich met Jeff Eckroth, the owner of Eckroth music, several years ago, and they hit it off. Eckroth Music Company has been around for over 45 years, with locations in North Dakota, Montana, and Minnesota, and now Eau Claire. They purchased the school band and orchestra portion of Morgan Music’s business, and will operate as a separate, but cooperative business in a shared location with Morgan Music. “We won’t compete on product. It’s a nice system,” said Tyler Henderson, manager of Eckroth Music. Morgan Music will continue to sell musical instruments, including guitars, basses, amplifiers, drums, pianos, keyboards, and more, as well as musical instrument accessories and sheet music. They will also offer lessons, service, and repair for most musical instruments. Eckroth Music Company both sells and rents instruments for students of all ages, and provides service at local schools, including inventory and repair. Eckroth Music Company also sells music accessories and method books. To learn more about both businesses, visit their store at 2405 E Clairemont Ave. or check out morganmusiconline.com and eckroth.com.